CANNES, France—After winning a Grand Prix in Print & Publishing at the Cannes Lions festival earlier this week, Y&R New Zealand won another Grand Prix tonight, this time in the Media category, for its Burger King "McWhopper" campaign. The idea was simple, but brilliant. Last August, the brand came up with a clever idea to hopefully band together with one of its greatest competitors—McDonald's—on Peace Day. BK bought a full-page ad in The New York Times and the Chicago Tribune (the city where the McDonald's headquarters is located), publishing an open letter of sorts to McDonald's, asking the brand to collaborate on a limited product, the "McWhopper," to be sold one day only. BK proposed that the chains meet in Atlanta, halfway between McDonald's headquarters in Chicago and Burger King's headquarters in Miami, and create a pop-up shop to sell the Burger King-McDonald's creation. All proceeds would go to Peace One Day, a non-profit organization dedicating to spreading peace. McDonald's CEO Steve Easterbrook vetoed the idea, suggesting the brands team up at a later date to create a "meaningful global effort," but BK had already gained a huge amount of media attention for its work. The idea inspired other burger chains to reach out with the hopes of raising awareness for Peace Day on Sept. 21. Denny's, Wayback Burger, Krystal and Giraffas all threw their names in the ring for a Peace Day partnership, responding to BK's initial letter on Twitter. 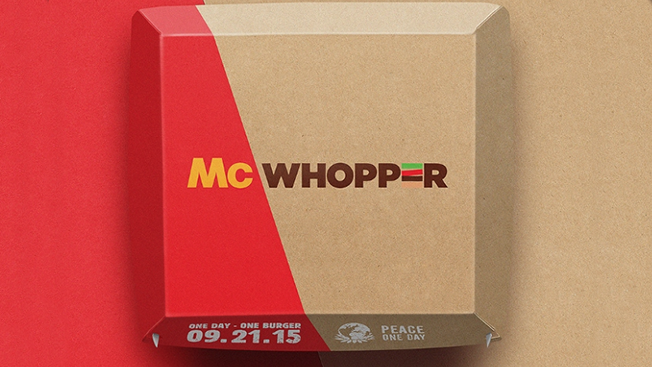 The success of the campaign can't be denied, and the jury couldn't resist handing the "McWhopper" another Grand Prix. "I think our Grand Prix reflects so much of what it good about the industry," said jury president Nick Waters, CEO of Dentsu Aegis Network Asia Pacific. "This is a case of a big brand. And big brands sometimes find it difficult to move quickly. This is a case of a big brand taking on an even bigger competitor, moving quickly, being bold, acting within the brand, acting cheekily, reacting to events, bringing consumers in," he added. Waters noted that the "McWhopper" campaign was the perfect Grand Prix choice for the Media category, stating that "none of this could have happened without a brilliant use of media. It would not have created such amazing momentum, such a storm, without a brilliant use of media." Code & Theory, Alison Brod Public Relations, The David Agency, Rock Orange, Turner Duckworth and Horizon all contributed to the campaign as well, alongside Y&R New Zealand. U.S. agencies took home a number of Lions in the Media category this year—no golds, but eight silvers and nine bronzes. Leo Burnett Chicago scored two silvers for its Van Gogh-inspired Airbnb rental for The Art Institute of Chicago. Starcom Mediavest Group Chicago won a silver for its Airbnb "No Borders" campaign, while FCB Chicago won silver for "The Baby Stroller Test-Ride" for Contours Strollers. VML New York's "Legoland Dollars" campaign for the Legoland Florida Resort scored silver as well. J. Walter Thompson New York's Tribeca Film Festival Reactor won a silver, while Grey New York won silver for the "Gun Crazy" campaign for States United to Prevent Gun Violence. R/GA Hustle L.A. also won a silver and bronze for "Straight Outta" for Beats by Dre. Other bronze winners include Deutsch L.A.'s first live music video with Gwen Stefani for Target; David Miami for the Burger King "Whopper Sign" work; McCann New York for "The Field Trip To Mars" campaign for Lockheed Martin; OMD New York for Intel's Winter X Games 2016 work; and CP+B Boulder for "Captain Obvious Runs for President" for Hotels.com. Grey New York won three Bronze Lions in Media: one for "Gun Crazy," one for Canon U.S.A.'s "Unknowns" and one for the Volvo "Highway Robbery" campaign.